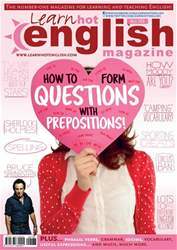 Digital Subscriptions > Learn Hot English > 183 > HOW TO FORM QUESTIONS WITH PREPOSITIONS! Standard English: Who did you send the letter to? Formal English: To whom did you send the letter? There are lots of useful expressions with verbs + prepositions. For example: listen to, wait for, look at, etc. But how do you form questions with them? Simple! Just put the preposition at the end.